1. 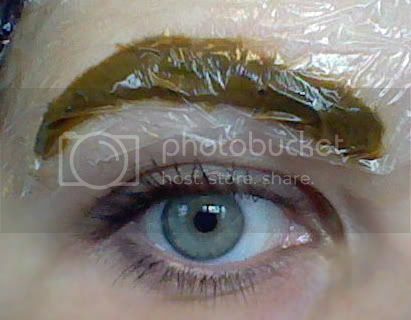 Start with putting the plastic gloves on and preparing the henna mixture for your eyebrows. 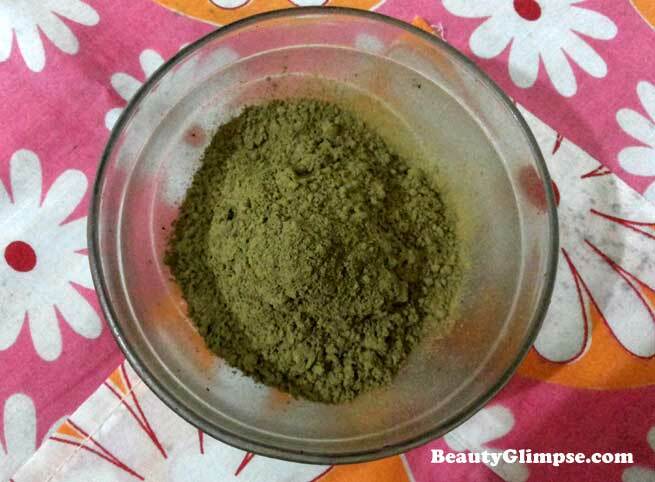 Put the henna powder and the organic amla powder in the small mixing bowl. Add resh lemon juice to it. Also, pour some water into the bowl. Combine all the ingredients with the spoon until you come up with a smooth, thick paste. Make sure that the consistency of the batter is so that it doesn’t drip off the spoon. Also, there should not be any lump or air bubble in it. 2. Cover the mixing bowl with a lid and keep it aside. You must keep it at room temperature and wait for the whole night. 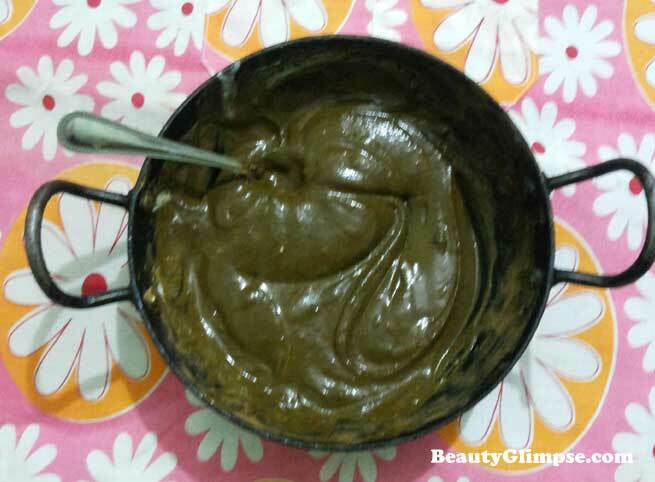 It will help the mixture sit properly, thereby releasing the maximum color from the henna. 3. Now, it is time to prepare your eyebrows for the dye. Cleanse your entire face with a mild face wash (focusing on the brows, of course) or simply wipe the dirt and grime off the brows with alcohol wipes. Let them dry for a few minutes. Then, apply shea butter around them liberally. It should not be applied onto your brows though. In order to make the task easier, you can even brush your brows inward with an eyebrow brush by making the hairs in the direction of the middle of the forehead. 4. Once you are done with all sorts of preparation, start applying the henna mixture on your eyebrows carefully. Just dip the mascara brush or the Q-Tip into the paste and move it along the direction of the growth of your brows one by one. You can follow small circular motions to coat each of your eyebrow hairs from the base to the tip. Overall, it should be a nice thick coat of henna. 5. 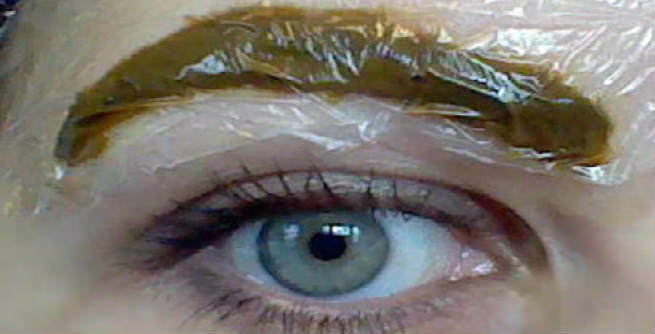 Now, you have to cover both of your brows with the pieces of kitchen wrap. Place them on your hennaed brows and smooth out their sides with your fingertips gently. They should get stuck to the skin around your brows nicely with no air bubble inside. 6. Now, just relax. The waiting time in this case maybe anywhere between 20 minutes to 2 hours, depending upon the strength of the color you actually want for your brows. 7. Finally, peel the kitchen wraps off your skin and rinse your rows with lukewarm water. You can also make use of a dry washcloth for wiping away the henna from your eyebrows followed by a plain water wash.
Aren’t your brows looking just perfectly dyed?